Happy peasants of a Rhineland village celebrate the vintage festival. The set depicts mountains and a castle tower overlooking a feudal scene. A young nobleman, Prince Albrecht (Claudio Coviello), disguised under the name of Loys, pays court to a girl named Giselle (Maria Eichwald) who accepts. What could be the harm in this? Maria Eichwald dances the role of Giselle brilliantly. She epitomises grace and beauty. Her initial pas de deux with Coviello expresses the exhilaration of a young couple transported by affection. But some are not convinced. Giselle’s mum (Daniela Siegrist) is caring but protective of her daughter. She warns her daughter of the wretched fate of the Wilis, the maidens who died before marriage and who, transformed into spirits, lure the men whom they encounter by night and compel them to dance to death. The gamekeeper Hilarion (Marco Agostina) suspects Loys’ true identity and is jealous of him. Coviello comports himself with the authority of his secret high rank, brushing aside the gamekeeper’s attempts to interfere. Alas, all is about to become unstuck. A procession of nobles who have been hunting arrives at the village, in attendance upon the Duke of Courland and his daughter Bathilde, who is engaged to Albrecht. Hilarion dramatically reveals that Albrecht and Loys are one and the same. Giselle has been betrayed by Albrecht. What follows is one of the most poignant transformations known to the world of ballet. 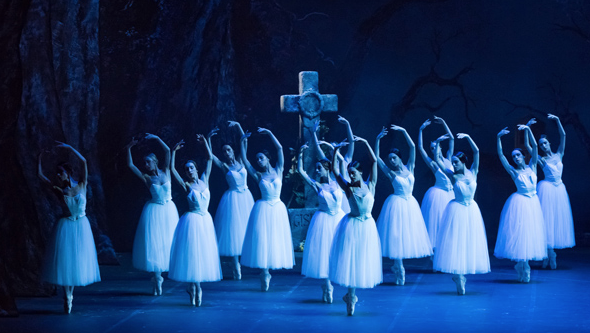 Eichwald expresses in dance Giselle’s agony in losing her heart, then her mind and ultimately her life. Back in 1973 your reviewer wept in the old Her Majesty’s Theatre here in Brisbane when the great Gailene Stock danced this mad scene in the Australian Ballet’s production of Giselle. Eichwald transports the audience into the pathos of a world of pain and loss. In Act II the amazing corps de ballet emerge as two dozen Wilis starkly costumed all in white. They are led by two Wilis (Alessandra Vassal and Emanuela Montanari). The formidable Queen of the Wilis, Myrtha, is danced powerfully by Maria Celeste Losa. Her rule is strict and unforgiving. A remorseful Albrecht falls under the magic spell of the Wilis and is condemned to dance until he dies. in the underworld, the harshness of law is not mollified by mercy. Despite Albrecht’s betrayal of her, Giselle intervenes to plead for Myrtha to forgive him, to no avail. Heroically, Giselle manages to save Albrecht by dancing with him until the sun rises. It is a triumph of love over sin and death. Eichwald dances this role with courage and subtlety. The chemistry of her pas de deux in the second Act with Coviello is intense but reflects some existential estrangement between the realms of life and death. It is all the more moving for that. At 44 years of age, Maria Eichwald dances with the vigour and lightness of youth. One is reminded that Dame Margot Fonteyn finally retired at the age of 60. On her 60th birthday the Royal Ballet officially pronounced her prima ballerina assoluta. Fonteyn first performed Giselle with Rudolf Nureyev at the age of 42 in 1962.